When picking a vacation destination, modern travelers have more choices than ever before. The history and unique charm of Europe are always popular, while the natural landscapes and diverse cultures of Asia also draw in many travelers from around the globe. Those who are looking for fun in the sun and want to spend a lot of time basking on beaches and soaking up the sunrays, however, might be better off visiting Central America. Nations like Costa Rica and Honduras are attracting a lot of travelers in recent years as more people start to see just how beautiful and untouched this part of the world is. Panama is another excellent example, especially for people looking for a great beach destination in Central America. Bordered by Costa Rica and Colombia, Panama is a long and narrow country with a lot of coastline. The northern stretch of coast looks out onto the Caribbean Sea, while the southern section faces out onto the Pacific Ocean. This means that Panama is home to a lot of beaches, and due to the shape and size of the country, you're never too far away from one of those beaches, no matter where you happen to be in Panama. With so many beautiful beaches to be discovered all around Panama, it can be hard for even the most experienced travelers to know which one to choose first. With that in mind, we’ve put together this easy-to-follow Panama beach guide. Below, you’ll find key information on some of the best beaches in Panama, including detailed descriptions of each location and an overview of what sort of activities and amenities you can find there. There are many different beaches to be found all around San Blas, but they're all so beautiful and perfect we simply can't pick just one. 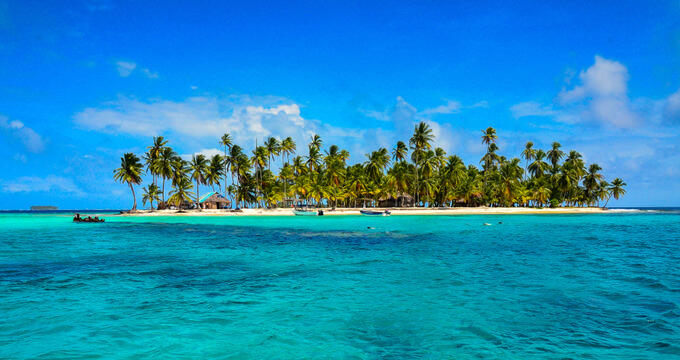 Instead, we recommend heading over to this archipelago in the Caribbean Sea and simply exploring the area, strolling along the seemingly never-ending beaches of soft sand, tall palms, and breathtaking waters. Tourists like to come here, but the tourism industry hasn't really affected San Blas, so the beaches are really natural and untouched. If you're looking for peace, quiet, and tranquility on a Panama beach, this is the place to be. Located in the province of Veraguas, Santa Catalina is another of Panama's coastal gems. This sleepy fishing village has seen quite a surge in popularity in recent years as word has started to spread among backpackers and surfers about the great beach here. Santa Catalina's waves can provide a real challenge to surfing enthusiasts, and it's a nice spot for diving, swimming, and fishing, along with romantic strolls in the early mornings or late in the evening. Isla Coiba is so beautiful that UNESCO actually gave it World Heritage status. Located in the Province of Veraguas, Isla Coiba is actually the largest island in all of Central America. Beloved by Panamanians and backpackers alike, this island is unquestionably home to some of Panama's best beaches. Lush vegetation sits at your back and stretches out all around you as you step out onto the soft, heavenly sands of this island's incredible coastline. Lots of local tour operators run diving and snorkeling expeditions around Isla Coiba too, so you won't want to miss out on those if you're a nature lover. Located at Bocas Del Toro, Red Frog Beach is named after the tiny red frogs that can be spotted hopping around the local area. It's a very special beach, beloved by so many people, and as soon as you visit this location, you'll want to come back time and time again in the future. It's one of the most pristine, untouched spots in all of Panama, blessed with some of the clearest, cleanest waters and smoothest, whitest sands. The wave conditions here can vary from gentle to quite choppy, making Red Frog Beach one of the best surfing spots in Panama at certain times of the year. Situated in the province of Colon, this island is easily accessible from the local coastal cities and definitely worthy of a visit. Surrounded on all sides by the warm, picturesque waters of the Caribbean Sea, Isla Grande has a really unique and varied beach, featuring both sandy and rocky spots, ripe for both sunbathing and exploration. The surrounding views from all around the island are simply incredible and the conditions here are great for surfing as well. Situated in the Bocas Del Toro archipelago, the Cayos Zapatillas are two separate small islands lined with mangroves and gorgeous slices of sandy heaven. They were named due to their unique shape, which is said to resemble a pair of slippers. The Cayos Zapatillas are excellent spots for sunbathing, swimming, and slipping into a state of total relaxation. These protected areas are also a popular place with local marine life, with many sea turtles seen nesting nearby. For shimmering turquoise waters and exceptionally soft sands, this Panama beach is a must-visit.